How To Unclog A Floor Drain? A clog in a floor drain is not something uncommon. Before we get to the methods of unclogging a clog in that drain, we shall talk about the drain. What causes clog in floor drains? Floor drain is a fixture that is fixed on the floor to drain any stagnated water on the floor. It is usually round, in structure. You might also find them in different shapes in many buildings. This drain is usually found in places where water can easily get stagnated inside the house like near kitchen sink, dishwasher, refrigerator, laundry equipment, swimming pools and others. It has a small strainer that prevents foreign objects from entering the drain and from unwanted pests to enter into the house from the sewers. This strainer is not a very smooth one and sometimes, small objects like hair and other dust elements tend to get through the strainer and end up clogging the drain. Just like any other drain in the house, the floor drains can also get clogged and can be unclogged with right equipment and cleaning solution. 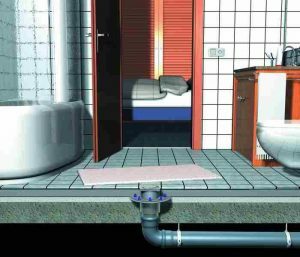 This article is focused on providing you a detailed description of all methods which are commonly used for unclogging the floor drain. If you feel that the process looks complicated at any point of time, it is better to get professional help. There are a lot of service providers who would serve you within 24 hours and solve the problem with minimum damage to the drain. 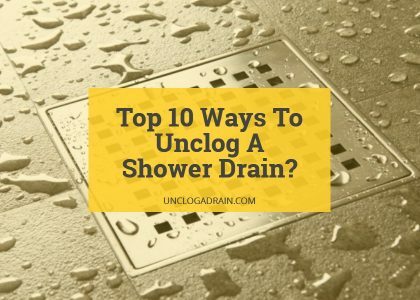 Any damage that you create to the drain pipes while unclogging would lead to serious problems and might need an extensive repair process, which would be both time consuming and expensive. 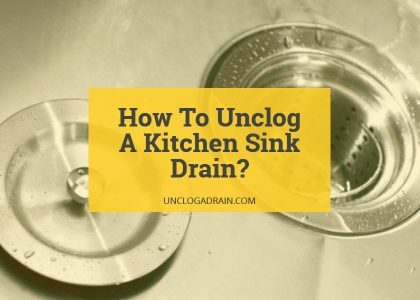 The first step is to understand whether it is a clog in the floor drain or other problem that has led to the stagnation of water. We will talk about other causes for clogs later. To identify this, remove the drain cover and you would find a small plug near the drain hole. This is called a clean out plug. The floor drain has two openings that would lead to the same drain pipe. The main opening is a U- shaped pipe and the clean out tube is a straight pipe and both leads to the same main drain. If there is a clog, the clean out plug would have no problem in draining the stagnated water, when opened. The clean out plug would be always closed. If it has a metal body, you would need a hammer and a chisel, to remove it. Most of the plugs would be made of plastic and it would be easy to remove them. Remove the plug and wait for a few seconds. If the stagnated water gets drained immediately, it is definitely a clog in the drain, due to some sort of debris. Replace the clean out plug. If you had damaged the clean out plug in this process, you can easily replace it with an expansion plug of 1 ½ size. It is easily found in almost all hardware stores. While replacing it, it is better to stick with plastic or rubber styled plug to make it easier, the next time. If you still prefer metal styled plug, there is no hard and fast rule. You can choose metal plug too. If the water does not drain, even after removing the plug, then there is other complicated problem which has led to the clogging. We will talk about the reasons, later. If the water does not get drained even after opening the plug, get professional help. Most probably, you would be having a big repair process, which cannot be self-handled. Yes, leaving the clean out plug open may sound like an easy solution to the problem if there is a clog in the main pipe. The normal drain pipe is given a U-shaped tube, for a reason. Due to the structure of the tube, a small amount of water remains stagnated in that curve, always. This water would stop sewer gas from entering into the pipe. If you leave the clean out plug open, you are allowing the gas to flow in and it would entirely damage the floor drain, leading to you spending a lot of money to repair it. This repair includes breaking the concrete or tiles around the pipe, replacing the pipe and then re-doing your floor. The time and money spent on this style of repair would be very high. Thus, after locating the clog, replace the drain plug. If you have damaged it or if the thread is rusted, it is better to replace the plug, you can find a replacement as mentioned before. The gas from the sewer does not just have a foul smell; it is harmful too. Yes, the main cause of clog is debris. When grease gets accumulated in the strainer or anywhere in the drain, it would pull other debris to stick with it. Over time, it would become a big block in the pipe and would stop the water from flowing down the pipe. this is usually the main reason for clogs in floor drains and in other drains. However, this is not the only reason to why water is not able to get drained. Here are some other reasons to why the water might be stagnated. Damaged or broken pipes – when the pipes are damaged due to wear and tear or, due to unprofessional use of strong drain machines, clog can happen. In these three occasions, the water would not get drained, even after opening the plug. Sometimes, after a heavy rain, leaves and dirt get accumulated in the pipes, leading to floor drains too. Even a small crack in the pipe would hinder the pressure of water draining in the pipe. This would lead to stagnation of water. You need to repair or replace the broken pipes. If you think that there is a clog, you can try out simple methods first and leave complex ones to professionals. This is a very common solution for almost all kinds of clogs. Do you remember you chemistry classes? When an acid and a base are mixed together, you would start a neutralization reaction which would let out carbon dioxide and a lot of bubbles. Vinegar is the acid here and baking soda is the base. 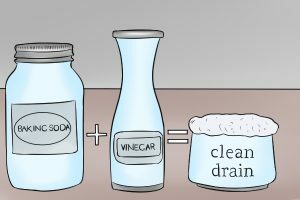 Vinegar and baking soda is used to dissolve the clog, thereby allowing flow of water through the floor drain. First, using a screwdriver, remove the drain cover. Make sure to keep the screws carefully so that you can fix the drain cover later. For hygiene, have rubber gloves on. If the clog is very close, put your hands in and scoop out the clog with your hand and dispose it in the garbage. If the clog is very deep or you are in no mood to put your hand into the drain, pour some boiling water through the drain opening. Then, add vinegar and soda in a bowl and pour it into the drain, once it starts to create bubbles. After ten minutes add another liter of boiling water and close the drain cover. This is also a preventive measure. If your floor drain gets clogged every now and then, you have to make sure that the clogs do not get accumulated too much. So, once in a while, add this solution to the drain to remove any accumulated dirt, before it blocks the whole path. Do not prepare the solution and store it. Once the neutralization process is done, the solution is no longer effective. Do not try this method after using any chemical drain cleaner. This is the easiest of all and there is no chance of damaging the pipes in this method. This is a very straightforward method to unclog a floor drain. Since the clog cannot pass through the floor drain, we are pushing it out by inserting a vacuum pressure. Place the plunger on the hole. If needed, apply petroleum jelly on the sides of the plunger to have a good grip. Now, depress the equipment with full force for several times. Do not worry. You would not end up having the clog on your floor. Yet, for safety, have some cleaning cloth and put your gloves on. If you get some clog, remove it and dispose it. Add hot water through the drain and replace the drain cap. You can also use vinegar and soda, after using a plunger. 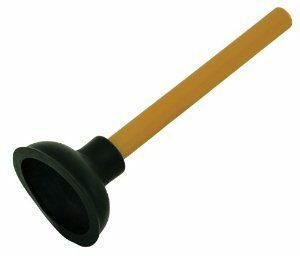 If you do not have a plunger, it is better to own it. It is simple and less expensive equipment that you ought to have in your home. There is no chance of damaging the drain pipes and plumbing in this method. Plumber’s snake or Drain Snake is a long steel wire with a hook at the end for pulling out the clog in your floor drain. You should insert the snake into the drain till you feel a resistance. The resistance is felt when you reach the clog. Now, rotate the snake so that the hook would attach itself to the clog and now, pull it up. Rotate the snake, while removing and repeat it as many times as needed. Have some sheets handy to dispose the waste off. If needed, add some hot boiling water after using snake. In certain cases, you may have to use vinegar and baking soda solution after using snake. Read in Detail: How To Use A Drain Snake? Do not give more pressure to the snake. You may break any pipe, which leads to bigger problems. Do not wriggle or try to pull it out, with force. Your hanger may look exactly like your snake. Your hanger might get stuck inside the drain leading to serious problem or causing damage to the drain. A snake is not very expensive. You can easily buy one from any hardware store. There are mechanical snakes available in the market. Make sure to learn the instructions in detail, before using it. Moreover, make sure to insert only medium pressure, while using mechanical snake. When snake or plunger does not work, it should be a stronger clog with grease and fat. You need something stronger to dissolve it and chemical drain cleaners can be a better option. 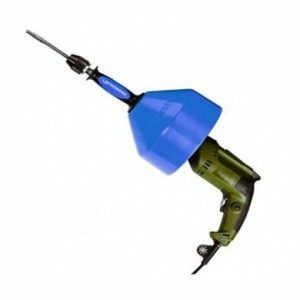 There are numerous chemical drain openers available in the market with different brand names. You are free to choose the one which you think would help you solve the problem. There are different styles of openers for different types of clogs too. Since this article is not an advocate of any chemical drain opener brand, we are not going to compare any two brands. Follow the instructions in the bottle. Sometimes, the drain opener would simply loosen the clog. You may need to use a snake or a plunger to remove it completely. Do not add vinegar soda or any other solution into the drain, after using a chemical drain opener. Do not mix any two brands of chemical drain opener. It may cause unwanted reactions. Wait for a few minutes and flush it out with a lot of water. In case of using tablet form of drain openers, throw a couple of tablets or as requested into the floor drain, overnight. This will give enough time for the tablets to work with the clog. Do not mix it along with vinegar soda solution. There should be at least an hour gap between the two solutions. You can use snake or plunger, after using this solution but not a suction machine. The solution is harmful, when ingested. Thus, do not keep it anywhere, where the kids or pets could get hold of this solution. These are bacteria based drain solution. After adding the solution into the floor drain, you should wait for a few minutes or as long as requested by the directions in the box. The bacteria will ingest all organic items and clear the clog. This solution is commonly used by people who are environment friendly and also who do not want to have harmful chemicals in their home. Do not immediately use boiling water. You would kill the bacteria. Using any other chemical solutions along with this type of drain opener would also kill the bacteria. The bacteria or the vinegar soda solution can easily dissolve organic waste debris in the clog. If it is rust, plastic or other non- organic debris, you can use any mechanical methods of any of the strong chemical drain opener solutions available in the market. Bacteria would not damage your plumbing and it is very safe to use too. Not everyone who will have a wet vacuum at home. You can rent it too. Before starting with the vacuuming, first use any simple mechanical method like snake or plunger. Try to remove any loose debris, as much as possible from the drain. Insert the hose of the vacuum and switch on the suction. Keep it low and slowly increase the speed of suction. First, insert the hose into the drain. When you feel the resistance, you have reached the clog. Start the suction and remove as much debris, as possible. Remove the hose and wait for a few seconds. Now, use any simple method like snake or vinegar soda to loosen up the clog. Again, use the wet vacuum. Repeat this as many times, as needed. In some cases, the clog would be very strong that your wet vacuum would do no good. In such cases, you would need a stronger suction machine like the professional drain cleaning machines. There are numerous ones available for rent but, stronger ones would lead to damage. Do not use chemical solutions along with the wet vacuum. Do not wear loose clothing, while operating. Learn to use the foot switch or other elements of the machine before operating it. In simple terms, these are upgraded versions of your simple wet vacuum. Are you planning to use the professional drain cleaning machines by yourself? You need not buy them from the market for one use. They are very costly to buy too. There are numerous places where you can rent such equipment. Before you check out any rental store, you should learn the location of the clog and size of your drain hole. You would need smaller draining machines if your drain line is smaller. For instance, a drain hole of 1 ½ inch to 3-inch diameter would need a small hose line of ½ inch cable. Larger floor drain would need ¾ inch cable. Using larger cable for a small hole would damage your pipes. There are numerous types of machines and it is not possible to explain the direction of usage of all. In general, position the drain machine a little away from the drain. Plug in the machine but, do not switch it on. Do not use the machine if you are wearing any loose accessories or if there are any important small things around you like your wallet, keys and others. Try inserting the cable into the drain and removing it to know your comfortable position. Place the foot switch near you. Switch on the plug and try controlling it with your foot switch. Once you are versed with these controls, feed the cable into the drain till you find the tension. If the motor slows down, you have reached the clog. Start the suction and stop once you feel that the sound of the motor has changed. This indicates that the clog is removed. These are the available methods to unclog a floor drain. If you are not comfortable in using these machines, there is no harm in getting help from professionals. Thank you for talking about how improperly installed pipes can cause your floor drains to clog. It makes sense that taking the time to understand what can cause problems in a floor drain can help you know what to do to prevent them. We are planning on remodeling our bathroom and installing a drain in the floor in case there is a flood, so I’m glad I found your post.